The iPhone 4S? Get It or Wait? If you were waiting for an iPhone 5 running on AT&T and Verizon's superfast LTE network or a larger screen size, Apple's announcement of the iPhone 4S was a huge disappointment. And for existing iPhone 4 owners, there's little reason to upgrade. If you're looking to get a smartphone this year, though, the iPhone 4S is a choice worth considering for it's upgraded camera and new Siri personal assistant. Those wanting access to Verizon's superfast LTE network or a larger 4- or 4.5-inch display, should look to some of the latest Android phones or hope that Apple will be release their next upgrade in early 2012. The iPhone 4S has two radios in it. One lets you use Verizon and Sprint's 3G networks, using a technology called CDMA EV-DO Rev. A. The other radio works on AT&T's HSDPA/UMTS/GSM network, which is the same technology used in Europe and most other areas of the world. The iPhone 4 worked on either network, but not both. The antenna has also been redesigned, which should result in better reception. In addition, the iPhone 4S is able to attain data download speeds double that of the iPhone 4–or at least is theoretical speed–with its move from AT&T's 7 Mbps HSDPA to 14.4 Mbps HSDPA network. Verizon customers will still be stuck with the same slow data network of the iPhone 4. People were hoping the iPhone 4S would work on AT&T and Verizon's LTE network, which in our tests blows the other networks out of the water. Unfortunately, that didn't happen, and should give current iPhone 4 customers pause when considering an upgrade until an LTE model is launched, perhaps early next year. With its new dual-core A5 processor, the iPhone 4S doubles the processing speed of the iPhone 4, according to Apple. The company also cites a seven-fold increase in graphics processing, which should make gamers happy. All this just puts it on the same playing field as today's high-end Android smartphones, including the Samsung Droid Charge (Verizon), Motorola Photon (Sprint) and the Motorola Atrix (AT&T). For most users though, the processor on the existing iPhone 4 is fast enough, so there is little reason to upgrade. Only testing will tell if the move from a 5 to an 8 megapixel sensor has improved image quality, but all the right specs are there. Apple is using a backside illumination sensor to let more light into each pixel, something you'll find in point-and-shoot cameras, enabling the sensor to capture more detail. Along those same lines, the lens is now a faster f/ 2.4 lens, versus the iPhone 4's f/2.8 lens. With a faster lens, the camera should be able to be used more effectively in low light situations. And there's face recognition for up to faces, which the camera uses to properly manage exposure. Video gets a resolution boost with 1080p recording (versus 720p) and benefits from the faster, low-light-friendly lens, but more importantly there's now video stabilization. Plus, you can output 1080p to your TV. 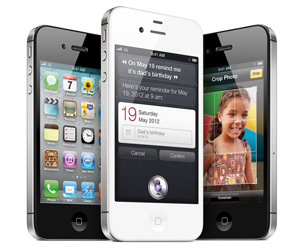 Apple is claiming an hour more talk time and an hour more Wi-Fi use with the iPhone 4S versus the iPhone 4. Some of this gain is due to a more efficient antenna design, according to Apple. 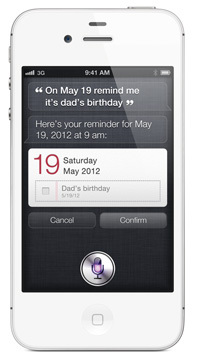 Siri is a virtual assistant app that will only run on the iPhone 4S. It uses natural language processing to understand what you're saying, asks for more information when necessary and performs tasks for you. Ask Siri "Do I need a jacket?" and it will give you an answer based on how cold it is outside. Or you can tell Siri to remind you to pick up eggs on your way home from work and it will sense when you've left your workplace and deliver the reminder. We've been promised the world in voice recognition and artificial intelligence apps before, and it rarely pans out as promised. Plus, most people probably make use of only a small fraction of the voice activation apps that are already on their phones. But if Apple is able to deliver something really special with Siri, it could be a killer app that would drive iPhone owners to upgrade and Android owners to switch. The iPhone 4S is exactly the same size as the iPhone 4, so the huge selection of current iPhone 4 cases will work with the iPhone 4S. If you're reaching the end of your 2-year contract with an iPhone 3Gs, I'd be very tempted to move on to the iPhone 4S. The performance gains are huge, and the idea of waiting potentially another 6 to 9 months for the iPhone 5 seems daunting. For iPhone 4 owners, I'd hold out unless you're a Verizon customer and need dual radios for international travel. The iPhone 4S is available for pre-order on October 7 through AT&T, Sprint, Verizon and Apple for $199 for a 16GB model, $299 for a 32GB model and $399 for a 64GB model, and will be in stores on October 14th. Perfect timing! I wanted help deciding whether to upgrade now or later. I think I’ll be upgrading very soon. My husband and I were a little disappointed with the reveal of the 4S only because we had assumed the 5 was coming. My husband is still using his 1st generation iPhone lol so he will still be upgrading anyway. It is still a huge upgrade for him!